Sift together plain flour, baking powder and salt in a bowl and keep it aside. In a bowl, add butter and powdered sugar and beat well. Then add egg and vanilla essence and beat well. Add sifted flour little by little and mix well and make a smooth dough using hand. Preheat oven to 160 degree celcius. Line baking sheets with parchment paper or aluminium foil. Take half portion out of the dough and roll it to a 1/4 inch thick. Cut into desired shapes using cookie cutter and place them on the prepared baking sheets. 6. Beat 1 egg and brush the cookies with egg wash. Perfect cookies .. loved the shapes. 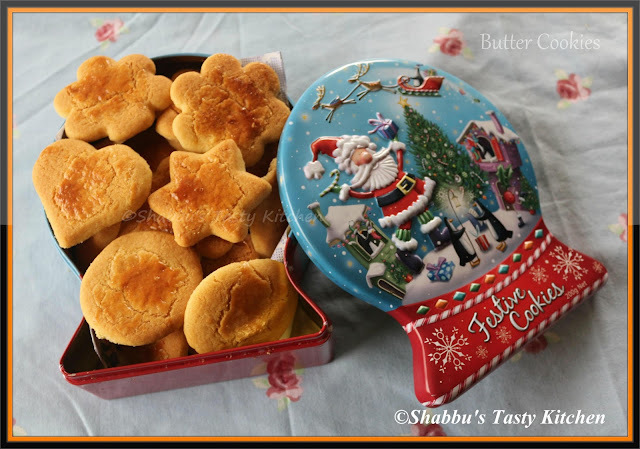 Crunchy munchy cookies,love to munch some. how much gm = 1 cup ?